026.Susanne Berkenheger – JavaMuseum 2010 – Celebrate! is a netartist and a satirist from Berlin/Germany), who writes for SPAM, the satirical online-section of the German magazine Der Spiegel. Everybody knows it: online communities consist of account corpses. They are the sad remains of the data of users who logged out long ago. Publicly they are proudly recorded as official members but internally they are totally ignored. 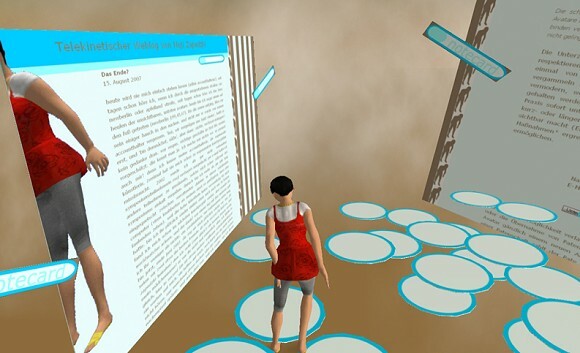 The worst is happening in Second Life: previously, in their lifetime, created lovingly, the account corpses now are denied all visibility. Only those who are socially successful, still in contact with a real life human, are smooching about in Second Life and don’t even consider that they are drifting through an army of invisible, miserable ghosts. Mutely sighing, the account corpses whisper to each other: they are only keeping us to sell us for a lot of money one day – account corpse trafficking! Is any online community free of this? Facebook, eBay, Xing, David Hasselhoff Fanclub, MySpace, Yahoo, Modern Grandparents, Flickr – they all want to make a fast buck on the backs of those who passed away. By general request of the account corpse scene we, the movement-for-account-corpses.de, are now pitting ourselves against the corpse traders. We are now beginning to force the metaverse “Second Life”, as the most despicable example of this kind of trading, to its knees. * the telekinetic web log of the avatar Muji Zapedzki, the official founder of the movement-for-account-corpses.de. This is where Muji mostly broods over her critical relationship with her account owner, the “so-called artist” Susanne Berkenheger. Muji is terrified by the thought – and not without reasons – that one day she’ll also end up as an account corpse.